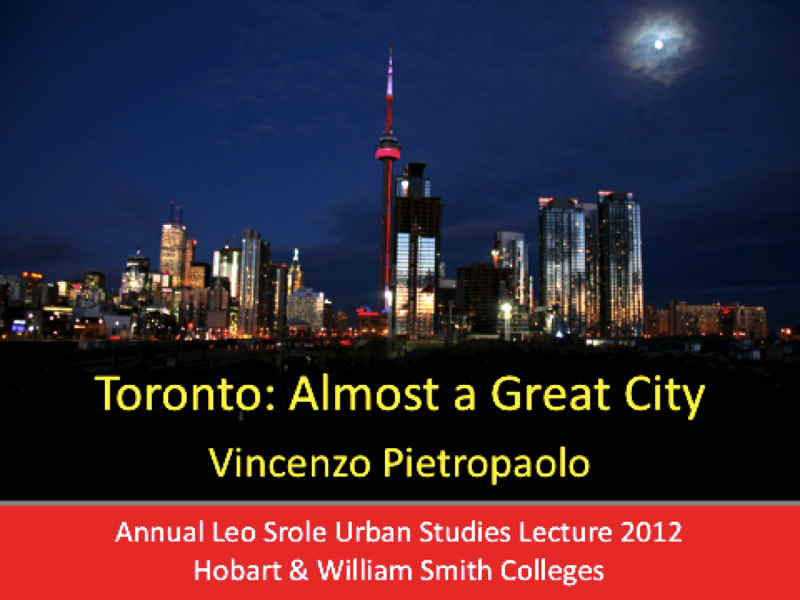 On April 19, 2012 Vincenzo Pietropaolo, a Toronto-based photographer, author and former city planner gave the Annual Leo Srole Urban Studies Lecture at Hobart & William Smith Colleges in Geneva, New York. 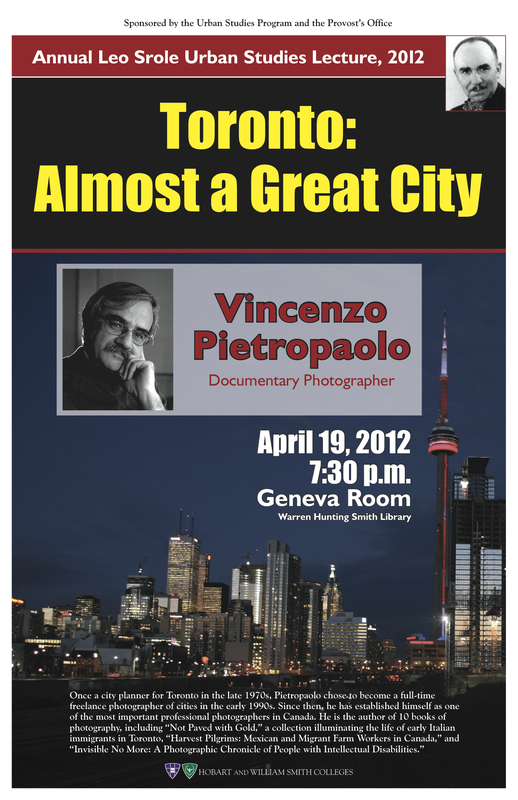 Over 100 of his photographs of Toronto, taken over a 40-year span, accompanied the presentation. We have included only a few. See http://vincepietropaolo.com/ for a more complete selection of his work. A lofty goal, no doubt, but these words have resonated with me throughout my career as a planner and as a photographer of the city, and they form the basis of measure of the presumed greatness of my hometown, Toronto. The word “great” is an overused and clichéd adjective, to be sure, for it is open to wide interpretation. Is a “great” city one which is distinguished by a profusion of large and distinct boulevards, architectural icons, cultural institutions, heritage buildings, the tallest of skyscrapers, and so on? Or is a “great” city one where everyday, ordinary of life can be lived with relative ease, without too much angst, without a debilitating daily struggle, without worrying about your safety, where all citizens have fair access to services, parks, stores, schools, housing, jobs? And this is exactly what happened in Toronto during the post war years. The city developed rapidly, and its population jumped from 1,000,000 in 1951 to 2,000,000 in 1971. The immigrants paved roads, toiled in the factories, and worked in all the shops. My father was a construction worker, and as a youngster I used to see him as a mere immigrant. Now I see him as a builder of my city, of my home if you will. For a city should be run like a “good” home environment, and a city can legitimately lay claim to greatness if in fact it can provide a good home to its citizens. After all, “home” and “home-town” are often used synonymously. But it is not a question about building a city only in physical terms: it is also about the city’s raison d’être, its very soul. For a city is far more than the sum of its buildings and structures. It is a place where enormous numbers of people who by virtue of living, working, and playing together achieve a critical mass that leads not only to exchange of old ideas, but to a fusion and distillation of new ones. Transformations of cultures can easily take place, as the host population is transformed by the newcomers and vice versa. For when you invite a guest to live with you, inevitably you will influence each other; maybe share a recipe, a story, a new perspective. As thousands of immigrants kept pouring in, the city of Toronto began to have a vision of itself that was defined by something other than its British heritage or its historical penchant for the American way of doing things. This new vision began to surface with the building of a new city hall, an architectural masterpiece that was the result of an international competition awarded to Finnish architect, Viljo Revell. It was the first time that the city had taken such a risk – to venture outside the country for such an important project. City Council had been persuaded to go international by the city’s first Jewish mayor, Nathan Phillips, for whom the square in front of city hall is named. Taking a great risk as mayor of a provincial city, he declared that “an eminent jury will select the winner and the City will accept its decision.” And so it was! It was reported to be the largest competition ever and more than 500 entries from 42 countries were received. The result was an iconic building that signaled the beginning of the end of the old world order and the welcoming of the new. It was 1965, and the city was well on its way to a new level of maturity. The days of puritanism would soon be over. Outdoor cafés began to spring up almost like mushrooms, and even Sunday shopping arrived. Finally! The cultural and literary landscape started to change, as immigrants and especially their children, began to produce films, plays, and novels – in English – based largely on what would come to be called the immigrant experience. Decidedly non Anglo-Saxon names like Michael Ondatjee, Nino Ricci, Joy Kogawa, Josef Skovorecky, Wayson Choy, and Bharati Mukherjee, to name a few, began to dominate the literary scene. All had in common one element: the immigrant experience, which was usually a bittersweet experience. Today the city is home to a literary force to be reckoned with, boasting a highly respected international literary festival, the Harbourfront Reading Series, and producing more theatre than any English- speaking city in the world except New York and London, both of which are true mega cities and both of which have far longer histories as centres of culture. Time Magazine declared long ago that Toronto was the literary capital of North America, noting also its great number of public libraries and bookstores. Today, the independent bookstores have mostly disappeared, victims of globalized marketing, and the public libraries – well, the current municipal government says we have too many, mockingly saying there are more libraries than Tim Horton Coffee shops. That’s not really true of course, but we do have 99 branches, all of them free of charge, it’s true, and we have the largest circulation in the world. In short order Toronto became the most diverse city in the world. There are over 140 languages and dialects spoken by people who identify themselves as being of 200 ethnic origins in the 2006 census. Like myself, over half of its population of 2.7 million was born outside the country. Immigrants have transformed the city from a staid commercial and administrative town to a vibrant cosmopolitan centre. An essential element of British influence that has been embedded since colonial times remains strong and is shared by the old and the new population alike: the tradition of caring and of service for its citizens. Service that comes out of a cultural sense of altruism. The city used to be governed from the bottom up, that is, citizens elected municipal councils based on a system of small wards, where the elected officials were usually accessible, where accountability and transparency were fundamental. There was little basis for political ideology in governing, though it was obviously there. In order to manage the rapid post-war growth and urbanization, the Province of Ontario, which has constitutional control over cities, created the Municipality of Metropolitan Toronto, by merging the city with 12 smaller cities and towns into one entity. Some were very small municipalities; indeed, rural villages that had morphed into suburban enclaves on the periphery of Toronto, and could not adequately provide basic infrastructure and services like transportation or policing, for instance. Metropolitan Toronto was restructured again in 1967, and this time the 13 local municipalities were amalgamated into six. But the two-tier metropolitan system of government was retained. After all, why “fix” something that is not broken? The old city of Toronto was the largest within the federation; it formed the geographic core, and was the economic powerhouse of the region. It would be the one to lead the way into bold new initiatives in land use planning, social policy, transportation, and culture. In 1974, in response to the lack of affordable housing, the city took an unprecedented step in order to counter the private sector’s inability or unwillingness to build affordable housing. The city of Toronto changed its Official Plan in the central area to permit residential building where only commercial had been allowed, to great opposition from the development industry. It then created its own housing agency, City Home, in essence becoming a developer and building housing for low to moderate-income people in a variety of built form and tenures. Financed by the federal government’s Central Mortgage and Housing Corporation under the provisions of the National Housing Act, it took direct action by effectively intervening in the market place. The buildings that they produced were not “projects” in the pejorative sense of the word, but innovative low-rise and medium-rise buildings, quality buildings sensitively designed to fulfill the agency’s social mandate and at the same time to preserve and strengthen existing residential neighbourhoods. And in one case, to actually build a new neighbourhood altogether – St. Lawrence – renamed Crombie Park after its beloved reformist mayor, David Crombie. Once an area of derelict underused warehousing, 3,500 units were built on 44 acres, laid out on a grid plan of new streets. It is now a thriving community that has been breathing new life into downtown Toronto since the early 1980s. It is the envy of many cities in the world, having achieved a high density, socially mixed neighbourhood that has integrated itself well with existing historical areas of mixed use – both commercial and residential. I would say that it exemplifies true municipal leadership and boldness in urban planning. But the city achieved much more than a significant increase of affordable housing units. The city planners introduced the idea that the future lay in creating residential areas downtown, or replacing what had actually been there historically but which had been lost in the euphoria and frenzy of developing suburban areas accessible only by cars in the 1950s and 60s. City Hall’s actions proved that living downtown was essential to a vibrant city, for it made public transit more efficient and therefore more affordable; it lessened the need for cars and expressways with all the attendant environmental and economic benefits. But more importantly, it had the effect of creating wealth – unintended, certainly. But within a few years, the private real estate industry realized that whereas they once scoffed at the idea of building residential buildings downtown, the reverse was now true. Living downtown was not only desirable and safe, but it created conditions of profitability for developers who had not been interested before. In my view, the great building boom of today in downtown Toronto – excessive as it is – is partly the result of the residential planning culture created through the visionary actions of the city brought about by its planning and housing policies of the early 1970s. Not many cities were doing anything like that in North America at the time. Downtowns had been relegated as areas for the poor and the recently arrived immigrants who couldn’t afford to move to the idealized swanky suburbs. Toronto distinguished itself for its boldness of vision, marked by the synchrony between planners and municipal politicians. What was happening was no less than Toronto beginning to shake away its inferiority complex by rejecting American ideas about urbanism, and coming onto its own. So the Spadina came to an abrupt dead-end, literally in front of a row of houses that had already been expropriated. A subway was quickly approved and built in its place – the University-Spadina Extension. Though the dead-end ditch with a four-lane road to nowhere made Toronto a laughing stock for years to come, it did result in saving huge tracts of city neighbourhoods and introduced new perspectives on transportation planning. Bold and radical perspectives at the time, going completely against the current. The 1970s were heady times for the city for other reasons as well. There was a commercial building boom downtown that saw the country’s largest skyscrapers transform the skyline, mostly with gleaming bank towers built by the best international architects like Mies van der Rohe. The CN Tower, completed in 1976, was the tallest freestanding structure in the world and it laid claim to that title for a quarter century, until it was eclipsed by a structure in Dubai. Today it is ranked 5th. The fact of the matter is that the city was poised to become a great city indeed, by taking bold planning actions, by offering an altruistic vision of itself to its citizens, by offering responsible government (that is to say, transparent and accountable) by exhibiting confidence at every turn. It was as if the city of Toronto was having a love affair with itself. In 1982, the city of immigrants threw an impromptu party when 200,000 people paraded up and down St Clair Avenue to celebrate the Soccer World’s Cup victory by Italy, from where the city’s largest ethnic group came. It was the biggest crowd in the city’s history. The event occurred totally unplanned, as people poured out of their homes and the cafés as soon as the soccer match was over on television. Not one store window was broken, and quite literally, not one flowerpot was knocked over. It helped that it was a Sunday afternoon and drinking was still not allowed in Toronto (except with your meal in the few licensed restaurants between the hours of 12:00 noon and 3:00 p.m…or something like that). But it didn’t matter if you were of Italian background, or whether you were a sports fan, you simply went into the street to celebrate with your neighbours. It was a Torontonian thing to do as never before, a seminal moment when the city of immigrants experienced an awakening to its own reality. The immigrants finally made the city their own. And that day in July 1982 would set the tone for decades; the streets would henceforth be closed on a regular basis, as different ethnic groups would “naturally” hold a street celebration after every major international sports tournament. Today we still have some of the biggest street parties in North America. The Caribana Parade attracts about one million people every year and the Gay Pride Parade easily surpasses the million mark. More recently, the Nuit Blanche Arts Festival provides the pretext for over a million people to stay out all night on streets as many major roads are transformed into nocturnal pedestrian malls. The love affair continued. In 1984 the city celebrated its sesquicentennial anniversary – that means 150 years in case you were wondering – and we partied again, as different commercial areas took turns closing down their streets. In 1988 the G7 Summit was held here, signaling international attention. That same year Pope John Paul II dropped by for a visit, as did Queen Elizabeth. And President Ronald Reagan. And Francois Mitterand. Nelson Mandela came by a few months after he was released from prison. 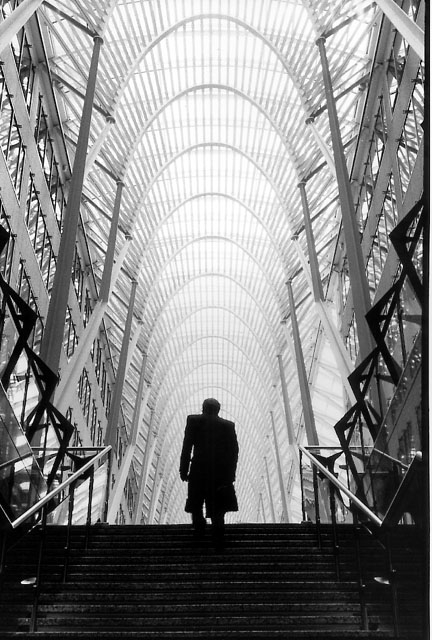 Toronto was no longer a backwater city; “Toronto works” was the new refrain, and town planners and local politicians gloated over its self-assigned “world class” stature. So if Toronto works, what is the problem, you might ask? Jane Jacobs once said that “cities, like people, are fragile things,” and it can take little to upset the balance that may have taken decades to establish. And this is exactly what happened in 1998. The health of a city depends on much more than good municipal planning. It depends also on social and economic policies of the higher levels of government. A new government led by the arch-conservative Mike Harris had come into power at the province a few years earlier. It had a right wing agenda that was so-called “reformist”, but which slashed social spending and infrastructure investment, eliminated services, while cutting taxes. The new government moved quickly to restructure almost everything, from health care to education to municipal government. They called it the “Common Sense Revolution”, but history has shown that there was little that made sense about it, particularly as far as the city was concerned. The government aimed at creating conditions that would more easily facilitate the forces of globalized trade and commerce, by downsizing and centralizing government, and by changing regulations in order to remove perceived impediments or constraints to business. The new government seemed to take special glee in punishing Toronto for its wide appeal, its success as a city. Once again it was a battle of the suburbs against the central area, but this time the outer suburbs of the Greater Toronto Area also joined in. Whereas 20 years earlier, the city had been championed by a conservative government, now a heavy ax would fall on the city. It was such a heavy blow that city has not yet recuperated. First came the cuts. Social assistance rates or welfare was cut by 22%, leading to an increase in homelessness. It was common to see people sleeping over grates of underground parking lots to keep warm. The government passed the Omnibus Bill, a draconian law that gave it unprecedented and wide-ranging powers to close hospitals, cut health spending, cut education spending, merge cities, and to sell off profitable assets like Ontario Hydro, as well as the hugely profitable government owned liquor stores (which they didn’t sell after all, realizing what a cash cow it is for the province). The list was long and comprehensive and most of the cuts affected the quality of life in Toronto. But the Premier went further, again with the support of suburban politicians, and changed the nature of municipal government forever: he amalgamated the six municipalities of Metropolitan Toronto into one large megalopolis of Toronto. It was a political masterstroke that in one fell swoop eliminated six positions of local mayor (including the progressive mayor of Toronto Barbara Hall who had led demonstrations against his policies) and dozens of local council seats, many of which were also held by his political opponents. It was called the “streamlining” of government, but in fact it resulted in a bigger bureaucracy and government became more costly than before. Bigger is not necessarily more economical. 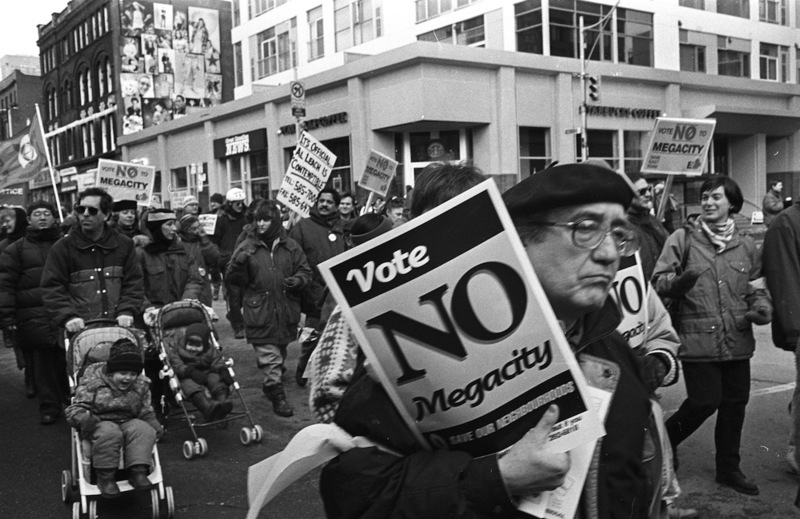 There was widespread opposition to the creation of a megacity, including referenda conducted by each of the six local city councils that were against the merger by a margin of three to one. But the referenda were totally ignored by the provincial government, as was its prerogative under the constitution. In the centralized municipal government, power flowed from the top down, the reverse of previous governance models. The creation of the megacity was only the beginning of the slow descent of Toronto. It was just the tipping point. Construction of a major subway line had begun along Eglinton Avenue West, a line that would connect the two north south lines with the western suburbs and the airport. The provincial government gave the order to stop construction, paid a huge amount in cancellation fees to the contractors, and the hole was quickly filled in again. Whereas in 1971 the provincial government halted the construction of a highway – Spadina – and replaced it with a subway, in 1995 the provincial government stopped the construction of a subway, and replaced it with nothing. 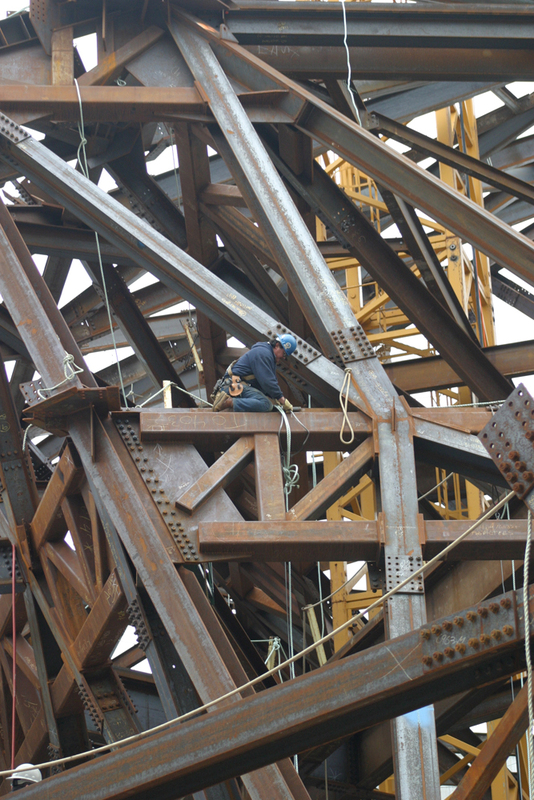 We haven’t seen major subway construction ever since, and as a city, we are far behind the times. Ironically construction of the very same subway line, known as the Crosstown, is just getting underway, some eighteen years later! The transit system is clogged, and the roadways are no better. A recent article in Toronto Life magazine (Toronto’s Traffic Time Bomb, by Philippe Preville, April, 2012) reports that the Greater Toronto Area (TGA) is the fourth most congested city in North America, with the average commute time of 79 minutes (up from 68 minutes in 1992). Traffic congestion is bad for the economy, for the environment, not to mention for the citizens’ collective sanity. Highway 401 in the north end of the city may have up to 16 lanes of traffic – the largest expressway in Canada and the busiest in North America – except that during rush hour, it is probably the slowest road on the continent. The numbers say it all: the annual expenditure on public transit averages $338 per capita in the Toronto Region, ranking it 15 out of 21 in a recent survey, behind cities like Montreal or Calgary, and way behind cities like New York ($703) or London ($1, 113). (Source: TCF Vital Signs 2012). A new expressway known as Highway 407 was built a few miles to the north of the city, paralleling Highway 401, in order to take care of the suburban overflow, but the same government privatized it, and the tolls are prohibitive. So much so, that truckers and commercial vehicles avoid it, as do most commuters except those of more significant means. We have effectively created a two-class system of highways, which has failed miserably to improve traffic flow in the city. By the time we remedy the situation it will take about 20 years, by which time we have to play catch-up again, since growth is expected to increase at a steady pace. And so the concept of disparity, even if in subtle guises, begins to become entrenched. This is not the making of a great city, then, is it? But disparity between rich and poor is a much more pervasive phenomenon than lopsided transportation services. The income gap is widening dramatically, and the middle class is being squeezed out of the city core. The condominium boom is concentrated mostly downtown or in the central part of the city, with the working classes and people on social assistance in the suburban fringes. So now we have the beginning of a geographic and social divide, in which one million people live in neighbourhoods with declining incomes. If present trends continue, by 2025 it is projected that low and very low-income neighbourhoods will cover 60% of the city’s neighbourhoods. (Source: Vital Signs, TCF, 2012) A city divided on drastically disparate income levels is hardly a healthy city; such a divide, between the enfranchised and the disenfranchised, is a recipe for disaster. Youth unemployment in the Toronto Region is 22%, well above the national average of 18%. (Source: Vital Signs, TCF, 2012). An economically disconnected population, especially among youth, can only compound the problem. As poverty becomes institutionalized, solutions become more difficult. Take social assistance as an example. In 2010, in order to buy the “nutritious food basket” – 67 basic food items representing current nutritional guidelines put together by the local Boards of Health – a family of four on social assistance needed $715.00 a month, or 37% of its income. But their rent would require 69%. (Source: Vital Signs, TCF, 2012) Where would they get their transportation, clothing, etc.? One of the results is that obesity levels are going up, something like 15% of those above 18 years of age are considered obese, twice the rate of Vancouver. (Source: Vital Signs, TCF, 2012) Food banks, which were established as stopgap, temporary measures have instead become permanent fixtures of the social landscape of the city. Although Toronto now has about 148 cranes (source: Toronto Star, April, 2012) on the ground (at last count) building skyscrapers and high-rise buildings – substantially more than any other city in North America – the cost of housing has skyrocketed. The average house price in Toronto is over $600,000 dollars. (Source: Vital Signs, TCF, 2012) According to a recent report by the Toronto Community Foundation, the Toronto Region has one of the most “most severely unaffordable housing markets in the world”, ranking 75th least affordable among 325 cities that were surveyed. (Source: Vital Signs, TCF, 2012) The city’s manufacturing sector is long gone, due mostly to the forces of globalization. With it went the good jobs. Many of the jobs are in the low-paying retail, service, and warehousing sectors. So we have an architectural landscape of shiny office towers and expensive condominiums, but we have a social landscape of income disparity, housing disparity, transportation disparity, entrenched poverty; in short a city divided. Many of these elements are beyond the control of the limited resources of the municipal government, but that matters little to the citizens who feel disconnected, whose sense of belonging is eroding, and who see the forces of greed and overabundance gaining ground every day. The city is on a dangerous and slippery road. What would I correct, if I could, to echo the words of Lewis Hine again? Recognize that as a collective home for its citizens, it is failing to provide equally the basic necessities of modern urban life which it used to do far better: food, shelter, transportation, employment – in other words, to create the conditions necessary for achieving a sense of dignity for its citizens. We need to make new massive investments in urban infrastructure and social services. That means new taxes and equitable redistribution of resources, which are the combined responsibilities of both the municipal and senior levels of government. We are a rich country, but I am not optimistic for the future, given the current political climate that aims to reduce corporate and personal income taxes, while cutting spending at the same time. We have a culture now that does not want to pay taxes, that fights tax increases, which is dangerous, for it leads to stagnation and deterioration. Ladies and gentlemen, I think we should be very worried about the sparrows. This is how I see it. Tags: City Home, Crombie Park, diversity in Toronto, immigrant construction workers in Toronto, income disparity, Leo Srole Urban Studies Lecture, making of a great city, Megacity, Spadina Expressway, Toronto amalgamation, Toronto city planning, traffic congestion. Bookmark the permalink.